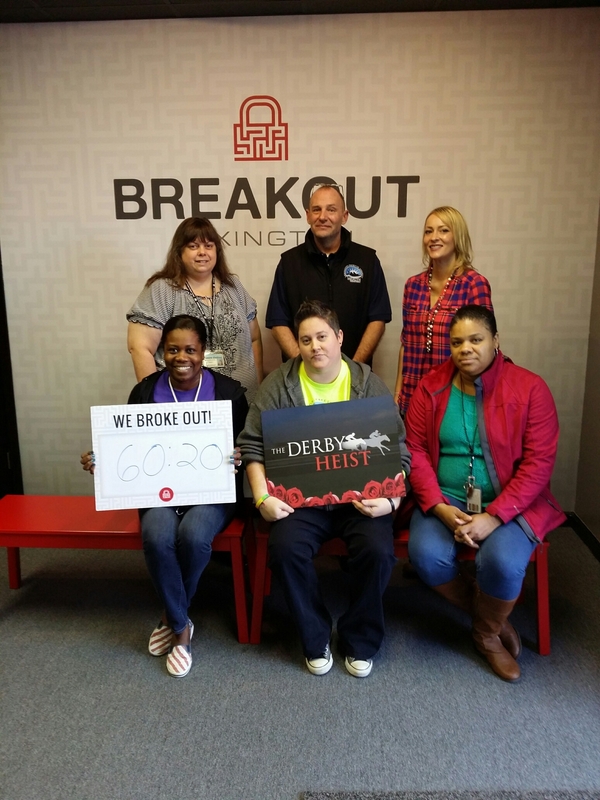 The Communicable Disease Team visited Breakout Lexington to challenge themselves to some super sleuthing good team building on Thursday, December 17. Each Breakout Game is a real life escape room adventure for a small group. Groups work together as a team to escape the room before time runs out. It is great for groups of friends, family or coworkers. You will solve puzzles, crack codes, find hidden items and more in order to escape. You have one goal: escape the room in under one hour. The CD Team was split into 2 groups, as the game rooms are small and only accommodate up to 8, and all participated in the Derby Heist Game. The group of Julie Moon, Lynnsey McGarrh, Maressa Starks-Baker, Laura Collins, John Moses and Sara Blankenship were able to recover the derby roses, the trophy and the winner’s check with a time of 60 minutes and 20 seconds. The group of Wanda Martin, Jessica Cobb, Aaron Mosley, Jr., Yvonne Beatty, Theresa Lakin, Kelly Swanner and Luke Mathis came close but did not end up completing in time. Even though both groups were not successful in breaking out, the team thoroughly enjoyed the opportunity to take some time away from the workplace to spend time together. The CD highly recommends this experience to others looking for a team building opportunity for their staff. The game was cost effective and not time consuming. 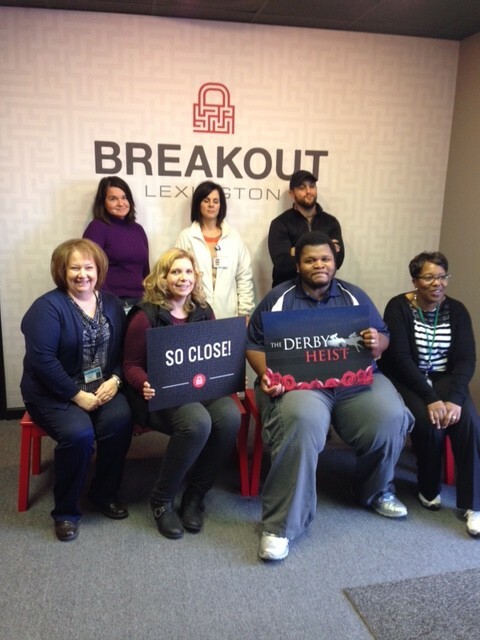 Click here for more information about Breakout Lexington or call 859-904-9090. Feel free to ask the CD Team members about their experience, just don’t expect any hints or answers to the clues and puzzles! Congratulations to Elayne Hollinger, Health Educator, on developing great partnerships with University of Kentucky’s Department of Kinesiology and Health Promotion, helping us build a strong community! 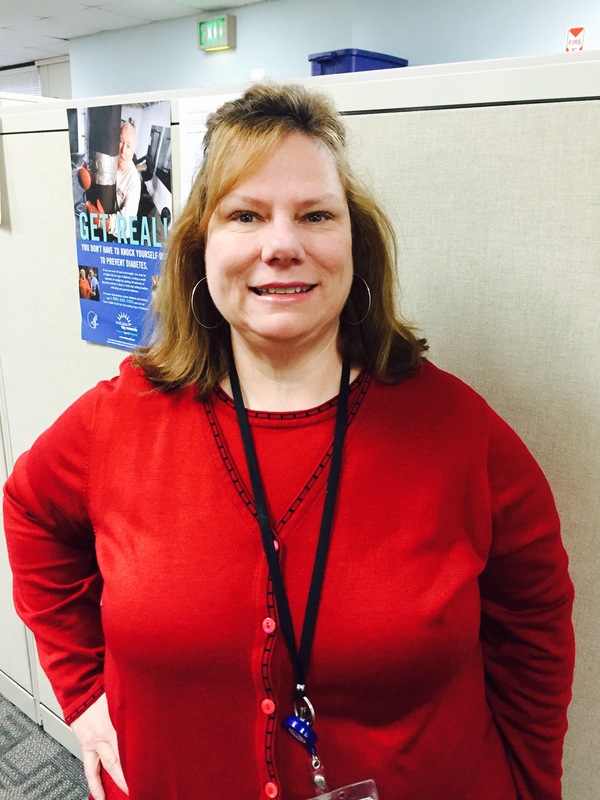 “The Lexington-Fayette County Health Department is fortunate to have an employee like Elayne Hollinger as a representative. 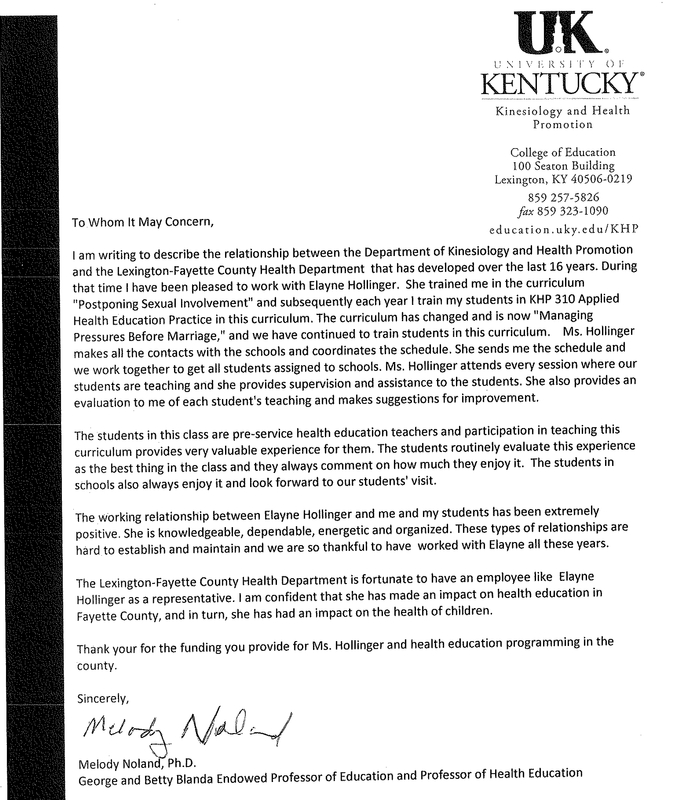 I am confident that she has made an impact on health education in Fayette County, and in turn, she has had an impact on the health of children.” Read more about Elayne’s accomplishments in a letter from Dr. Melody Noland, Professor of Education and Professor of Health Education at the University of Kentucky. “Helping Lexington be well” is what we do as employees of the Lexington-Fayette County Health Department. Even though our main focus is outside the doors of 650 Newtown Pike, we need to also take time to focus on ourselves, our clients, and our co-workers and make sure we know what to do in the event of a medical emergency. Please take time to read and understand the Medical Emergency Policy located on the intranet under PoliciesSafety and SecurityMedical Emergency or by clicking here. It is also important that you update your emergency contact information with Human Resources. Your supervisor will use that information to contact those individuals if/when necessary. After reviewing the Medical Emergency policy, if you have any questions, please contact your supervisor. It’s National Influenza Vaccination Week, and we’re using it as a time to remind the community there’s still time (and need) to get a flu shot for the season. Please share information about the importance of flu shots, as well as details about our clinic’s flu shot hours, to any interested patients/clients. 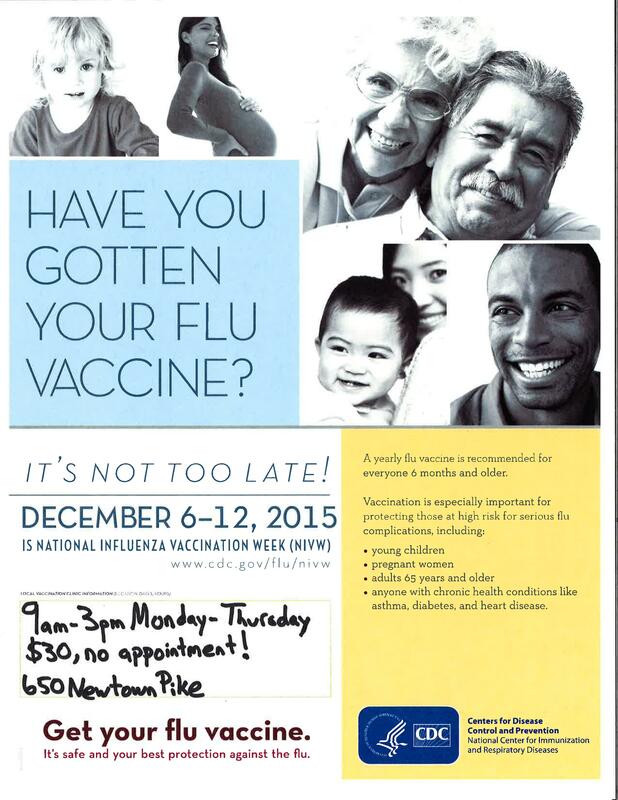 The Public Health Clinic offers flu shots 9 a.m.-3 p.m. Monday-Thursday. They cost $30, and no appointment is necessary. Carol Hisle, a nurse specialist at the Lexington-Fayette County Health Department, recently renewed the Certified Diabetes Educator status after completing the continuing education renewal option process from the National Certification Board for Diabetes Educators. Candidates must meet rigorous eligibility requirements to be eligible for certification. Achieving the CDE credential demonstrates to people with diabetes and employers that the health care professional possesses distinct and specialized knowledge, thereby promoting quality of care for people with diabetes. Currently, there are more than 18,800 diabetes educators who hold NCBDE certification. 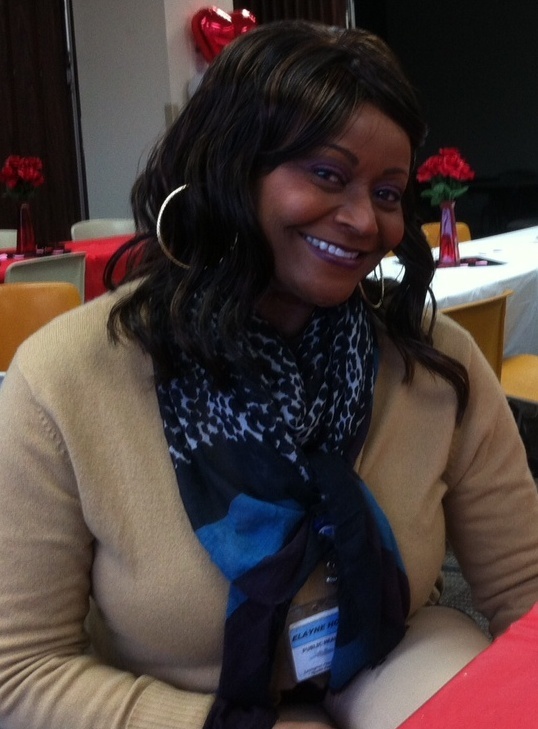 Hisle has been with LFCHD since December 2014 and has worked in diabetes for more than 19 years, including 15 years as a certified educator. The health department provides diabetes information, counseling, nutrition tips and more for people with diabetes, their families, physicians and the community. For more on the program, call (859) 288-2310.